periyavAchchAn piLLai, who is celebrated as parama kAruNikar (most merciful) in our sampradAyam, first finished doing 24000 padi vyAkyAnam for thiruvAimozhi based on nampiLLai’s approval. Then periyavAchchAn piLLai started doing vyAkyAnam for the remaining three-thousands of the aruLich cheyal (dhivya prabandham). First, he writes vyAkyAnam for thirupallANdu. Let us start enjoying the highlights of this nectar. 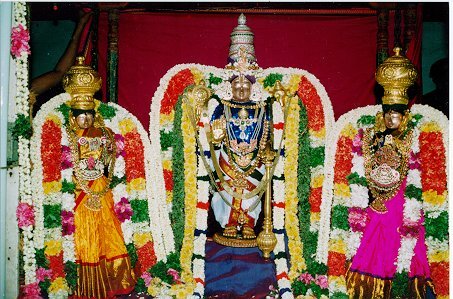 The swarUpam of emperumAn is sarvaswAmi (master of all others) and sarvaniyanthA (one who rules all others), whereas the swarUpam of jIvAthmA is dhAsathvam. Pertaining to this knowledge, the prApthi (right) of jIvAthmA (chEthanan – sentient) towards emperumAn is bhagavath kainkaryam. But the chEthanas take the wrong route of going away from this wonderful purushArththam (goal) due to the sambandham (relationship) with achith. On seeing this, to ensure that the chEthanas turn towards emperumAn, Iswaran first gave us sAsthram. On seeing that giving sAsthrams also not helping, emperumAn did thiruvavathArams (incarnations) in leelA vibhUthi trying to establish dharmam and the required activities, by showing himself living in this world according to sAsthram. But even that effort was also in vain, as none of the samsAris turned towards emperumAn, rather all of them started saying that such thiruvavathArams are also one amongst us and not Iswara!! So, to correct samsAris emperumAn gave srI periyAzhwAr to this world. If so, what is the glory of srI periyAzhwAr. Let us see that. This AzhwAr has natural dhAsathvam towards emperumAn. This can be understood by his own words “EzhAtkAlum pazhippilOm nAngaL” in thirupallANdu. Because of this, periyAzhwAr realized that emperumAn’s kainkaryam is this jIvAthmA’s deed to be done and found that krishNan, himself, went to srI mAlAkArar’s thirumALigai and took the garland from him. From then onwards, srI periyAzhwAr was doing pushpa kainkaryam to vatapathrasAyi emperumAn of srivillipuththUr. All other AzhwArs used emperumAn for their samruththi (flourishment). But periyAzhwAr held bhagavath samruththi (mangalAsAsanam) as his purushArththam. Similairly, thiruppallANdu is also much different from other dhivya prabandhams. This is even precious than thiruvAimozhi itself. This entry was posted in mudhalAyiram, thiruppallANdu on June 7, 2015 by sutharsan srinivasan.